December my new kettle gives up the ghost, January my toaster is knackered( about 5 months old) and today the iron shorts and spills rusty water on white shirt. I am beginning to think that domesity is not my friend. Anyway who cares back to miniatures, I can use the grill, the kettle was under guarantee and I do as little ironing as possible. Didn't do any sculpting today but I have put a couple of cake boards and stands together. I have a nagging suspicion that I was meant to be sculpting something special today but, for the life of me I cannot remember what it is. Last night in bed when I should have been sleeping I had a moment of inspiration, I should have written it down. I will probably remember tomorrow when I am back at work. 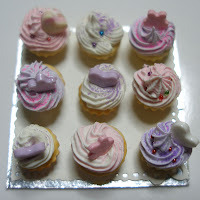 This entry was posted in and tagged dollshouse food, miniature dollhouse, mini food on February 23, 2009 by Sarah. Yesterday I made lots of glorious cupcakes, if only they were real, I'd be as fat as a pig. Once I got the consistency of the icing right there was no stopping me. I even made meringues when I ran out of cake bases. So all in all yesterday was a very productive day although, it ended with me covered in cornstarch and hardening acrylic paste (may have ruined a jumper but its only cheap and old). However today is a very different story, I do not usually drink..... Well you know where this is going, I had a little drink last night, oh dear lets just say there will be no sculpting today due to illness, self imposed I know but still as painful. At least I remember now why I do not usually drink. Before I return to the sofa and hangover TV here's a reminder of better times. 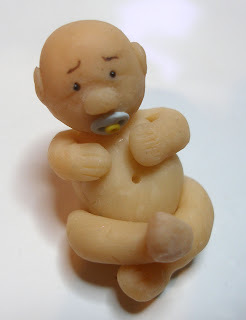 This entry was posted in and tagged cupcake, dollhouse miniatures, miniature food on February 22, 2009 by Sarah. Usually I sculpt 1/12th Scale dollhouse food but, after perusing doll sites I thought I would have a go. Well what can I say! First I thought I had made a dust magnet, where did all the dust come from was it waiting for me to start sculpting? Oh yeah and in my excitement I forgot to wash my hands so, now I have a dirty bit of polymer clay covered in bits of dust. On the bright side he has no visible finger prints. Into the oven he goes oh dear I slightly burnt his right foot, never mind its hardly noticable now that I have sanded it down and cut a bit off. His nose is too big and he looks like an old man but I actually think he's quite cute however I think I will stick to dollhouse food from now on. This entry was posted in and tagged dollhouse miniatures, dollhouse food on February 21, 2009 by Sarah.